Everyone knows that Fig and Duck can sing a nice song and that Arugula hits the same nutty note time and again. Strawberry and Chèvre hit both the high notes and low notes, leaving plenty of room for Fig and Duck to chime in. It is Onion that can sometimes venture off-key. However, choose an already sweet one from Walla Walla or Maui and it is sure to fit in. Macerated in a little vinegar and tuned up with olive oil, the band gets together and plays a nice gig called, “Summertime, Salad, Strawberries and Fig”. They will be performing (as an encore) this weekend over at Angie’s weekly party, Fiesta Friday. When making this salad for just Tom and myself, I usually still use the same proportions for the vinaigrette; it can be used throughout the week for other salads or to drizzle over fish. The amount of strawberries, figs and onions you macerate can vary depending on how many people you are serving. Any leftover onions are delicious on the grill to serve with your next meal (I just grilled my leftover onions last night and served them with our hanger steak). 6 qty. 1″ x 1″ pieces of bread. Brush with olive oil and grill to just golden each side (1-2 minutes each side depending on grill). Do this in a sauté pan if grilling is not an option. 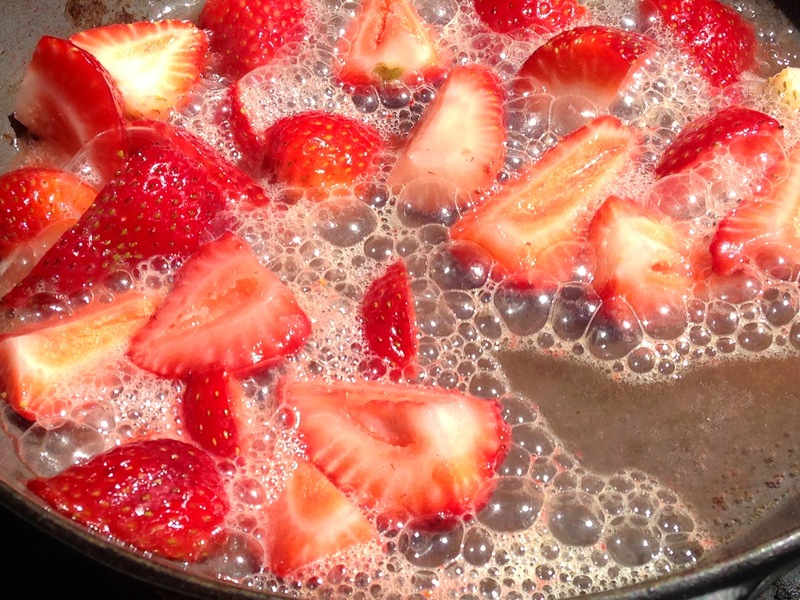 Sauté the 7 strawberries in butter a minute or two until they are slightly loosened. Add the sparkling wine or prosecco and continue to cook until some juices from the berries release. Reduce this down to about 3-4 TB liquid (it will be pinkish in hue). Transfer the mixture to a chinois and squeeze the liquid into a bowl. You should have about 1/4 cup liquid. Add the vinegar plus whisk in the oil. Season with sea salt and pepper. Add the cut onions to the vinaigrette, along with the cut figs and strawberries. Cover with a lid (or wrap) and let sit to macerate for a 1/2-hour or so, (seasoned to taste, with a little sea salt and pepper, if needed). Brush the bread cubes with olive oil and grill them until slightly golden on each side (1-2 minutes per side). Alternatively, you can do this in a sauté pan. Heat the duck confit on a piece of foil in a 350 degree oven until just warm, approximately 5 minutes. Mound a small pile of arugula, tightly, on the center of each plate. Top with a crouton. Using a spoon, drizzle some of the vinaigrette over each mound (mindfully saving a little for you… for later, in a jar). Using tongs, divvy, the onion pieces, strawberry slices and fig quarters among plates. Divide the duck meat among the plates, tucking it in in with the fruit. Crumble over goat cheese. Enjoy. Last one to the party misses out on the duck!!! Thanks Prudy! They must play a serenade, just for you. Your first fig? Are you now hooked? They are my most anticipated fruit to come into season. I will happily share creations with you sometime this summer. Beautifully made. Would like to try that one. Thanks, I hope you do (perhaps for one of your picnics). Thanks Linda, glad to hear. Hope you have a pint of figs sitting on your counter at the ready. This duck confit salad looks delightful, thank you for bringing it to the Fiesta Friday party this week, I hope you are having a great time! Thanks Saucy, a singing salad is what every dinner party needs. It was all Strawberry and Fig, although Duck does likes to steal the show. Cheers! Yum I love duck and I love figs, this all sounds amazing! As long as I’ve known them, Duck and Fig have been a perfect couple. Thanks, they are good together (or alone, for that matter). Brava!!! What a great combo! I have to start sourcing the confit. With figs hitting the markets, this is one performance I just have to see. Thanks for sharing. You should be able to get the confit at Whole Foods. You will have to check out the performance soon as it sells out rather quickly (shirt season). Cheers. Boy oh boy, may I have a plate of this?? I had a taco filled with duck confit, fig jam, and pickled daikon and carrots recently. It was incredible. Well that sounds like the perfect taco; it has many of my favorite things.